Presented by Woodbine Entertainment. Mike Penna and Jude Feld broadcast live from our Jimmy John's of Lexington studio. Special guests include Breeders' Cup VP Pete Rotondo, Gulfstream handicapper Ron Nicoletti, and Trainer Doug O'Neill. Presented by Woodbine Entertainment. Anthony Stabile and Steve Grabowski broadcast live from Pen National Race Course, and look forward to the Penn Mile. Special guests include Trainer John Servis, Hawkish Owner Justin Nicholson, Eric Johnston, Director of Racing Operations at Penn National, Dr Jerry Pack, association vet at Penn National, Jenny Tipa, racing secretary at Penn National, and Todd Mostoller, Executive Director of the HBPA. Presented by Farmpaint.com. Mike Penna and Jude Feld broadcast from our Jimmy John's of Lexington studio. Special guests include Terry Meyocks, National Manager of the Jockeys’ Guild, Sharlene Kenny from Bergen Stables, Jockey Joe Bravo, and Terri Burch, Interim Director of the University of Louisville Equine Business Program. Presented by FarmPaint.com. Mike Penna and Kurt Becker broadcast live from Pimlico and look forward to the Preakness. 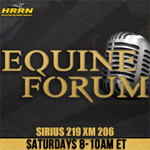 Special guests include Justify Breeder Tanya Gunther, Vance Hanson from Bris, Jockey Edgar Prado, Trainer and John Servis, plus a special interview with Bob Baffert & D. Wayne Lukas. Presented by Farmpaint.com. Mike Penna and Jude Feld broadcast live from our jimmy John's of Lexington Studio, look back on the Kentucky Derby, and look forward to the Preakness. Special guests include Acacia Courtney from Gulfstream Park, Michael Hernon from Gainesway Farm, Elliott Walden of WinStar, Brent Elliott, Master Distiller at Four Roses Bourbon, and Peter Eurton. Presented by Farm Paint.com. Anthony Stabile broadcasts live on Derby morning and gets ready for the 144th Run for the Roses. Special guests include Monomoy Girl Trainer Brad Cox, HRRN Handicapper Steve Grabowski, Mark Otto from Red Brand Fence, and Mike Penna. Plus, interviews with Todd Pletcher and Tom Amos. Presented by Red Brand Fence. Mike Penna broadcasts from our Jimmy John's of Lexington studio and looks forward to the Kentucky Derby. Special guests include Bill Badgett, GM Gulfstream Park, Eric Barlund, from Tito’s Handmade Vodka, Lori Douglas & Bill Bratcher from Farmpaint.com, and Elliott Walden, President, CEO & Racing Manager of WinStar Farm.